Benjamin Von Wong over at the VonWongBlog shared a creative tool that we immediately loved! 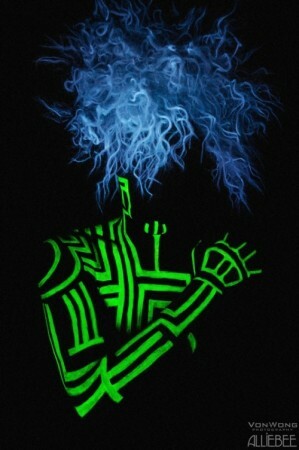 Using Black Lights and a mystery fluid he was able to capture a futuristic-Tron-like self portrait. OK, it was not a mystery fluid, just office markers, and while painting office markers on your body may seem kinda dull, magic happens once you turn off the every-day-boring-florescent-lights and kick in the super-cool-magic-black-lights. Watch the video with Ben’s explanation after the jump. While getting body painting as complex as this may require a specialist Henna painter ( Ben asked Alliebee), I would love to see what’ll happen if I gave a marker to my 1 year old and let her go wild.